Just like you, we want your pet to live the longest, healthiest life possible. That starts with the basics: quality food, enough exercise, good grooming and yes, regular check-ups. Annual wellness exams are your pet’s first line of defense. Bell Veterinary Hospital’s comprehensive annual exams include checking your pet’s overall health from nose to tail and looking for any changes that may have occurred. These wellness exams also allow us to develop a customized care plan for your pet’s optimal health—one that includes prevention like vaccines and blood screenings, parasite protection, nutritional and behavioral advice and medical intervention when needed. While we do recommend annual visits for all adult dogs and cats, we do believe that senior animals should have twice-yearly exams and blood work. Pets age differently based on species, breed and size, but generally speaking, most dogs are considered seniors around age seven; cats at nine. Since animals age much faster than we do, disease and illness progress more quickly, and we want to catch problems early while they’re more treatable. Wellness exams are also important for another reason: they enable us to truly get to know you and your pet. We consider it part of our job as your pet’s health care provider to understand not only your animal companion’s physical needs, but to support the bond you have with your pet. 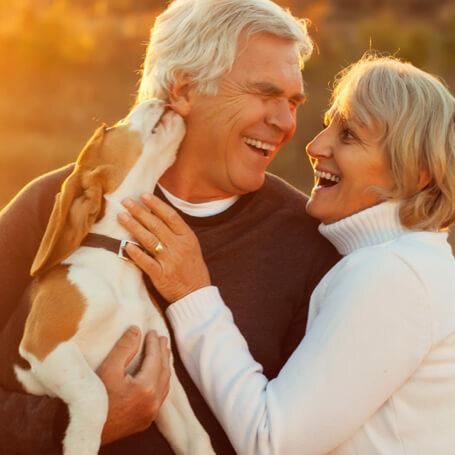 Our goal is to help your pet have as many happy, healthy years with you as possible. To schedule an exam for your pet, request an appointment online or give us a call at 205-709-8286.